CLICK HERE AND LISTEN ONLINE! Click here and play the game. Need some Valentines games ideas for a Valentine's Day party at school or at home? Here are some great ideas for fun Valentines games for kids from About.com’s Guide to Kids’ Parties and Celebrations. Click here and read them. Valentine's Day (Saint Valentine's Day) is an occasion celebrated on February 14. 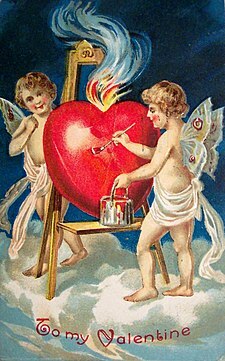 It is the traditional day on which people express their love for each other by sending Valentine's cards, presenting flowers, or offering confectionery. CLICK HERE!!! to learn about Valentine's day. If you're looking for a gift for your Valentine, you've come to the right place. We've gathered up all our top picks for Valentine's Day 2013, from men and women's watches and fragrances, to jewelry, chocolates, clothing and more. So whatever age you're shopping for, we've got Valentine's ideas you'll love. Have a look around and find something special for your Valentine. Click here and send to your favourite persons a Valentine's card to make them happy this beuatiful day. Επισκέψου αυτή τη σελίδα και άκουσε το τραγούδι του Νινο που είναι αφιερωμένο στην ημέρα των ερωτευμένων!! Υ.Γ. : Το τραγούδι είναι με τους στοίχους.